The new generation of Kraftformer helps you to produce exact results. This is achieved by a motor driven adjustable stroke position with a repeat accuracy from 0.1 mm. Tool query and electronic mistake diagnosis, as well as indicated maintenance intervals protect an optimum machine usage. The new generation of Kraftformer is characterized by a modern comtemporary design. The electronic display of the control system visualizes operations, fault tracing and indicated maintenance rates which ensure an optimum machine utilization. Storable processing programs allow repeatable results. The KF324 is driven by an electric motor at 400 strokes per minute. (Specify voltage when ordering). The KF324 has a hand wheel for the jaw pressure adjustment. The jaws can be replaced in a matter of seconds so that you can quickly change from task to task. Mounted on heavy duty casters which allow you to move the unit around the shop or out of the way when not in use. These units are extremely popular in auto restoration and fabrication shops, as well as throughout the aviation industry. 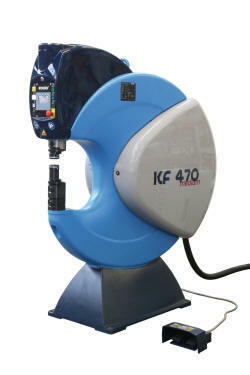 The KF340 Kraftformer has an adjustable operating speed from 250 to 550 strokes per minute. The lower speeds are ideal for shrinking and straightening, while the higher speeds are best suited for stretching, doming and planishing. This unit has ample power to work steel up to .118" and aluminum to .157" thicknesses. The foot pedal adjusts the jaw pressure and also has an emergency stop function. As with all Eckold machines, the new KF340 has a quick change jaw feature and accepts all the jaws and accessories used with the KF324 machine. The KF170PDK is the smallest in the Kraftformer program. Unlike the larger models, this machine is air opperated and equipped with both continuous and single stroke operation. Extraordinary precise pre-selection and control of pressure make this Kraftformer ideal for correcting and adjusting work. The single stroke function allows for punching, notching, and clinching tooling. The KF170PDK comes equipped with FWA405K shrinking and FWR407K stretching jaws. The KF170PDK-BM is a Bench Mount version of the KF170PDK.